I hope everyone’s having a great weekend and kicking off the first day of Spring on a happy note! I’m currently writing from my parents’ in the midst of a big celebratory weekend. My sister, her fiancé, Matt, L and I have been planning to be together this weekend and celebrate my parents’ big birthdays (my dad’s was a couple of weeks ago and my mom’s is next week)! Of course it was fun to all just be together, but it was a very special treat that the 6 of us (adults only) all went out to dinner last night. Can you believe that we hadn’t done that since before L was born? We kicked the evening off with some bubbly and then enjoyed a ton of good food. From fried zucchini chips, to grilled octopus and warm pita bread, it was all delicious. We also brought birthday cake and cupcakes (extra icing for mom and lemon poppy seed cupcakes for dad). Someone was such a big help with the stroller haha! 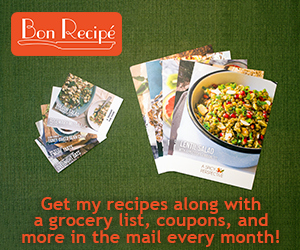 1) I’m really excited to tell you about the launch of Bon Recipé! It’s a service that brings my recipes (and others!) straight to your door , accompanied with coupons, giveaways, and other offers. Even better, proceeds go towards a charity that feeds hungry children around the world. Check it out today! 2) This recipe for chocolate quick-bread is SO good. I made it twice in one week and it disappeared very quickly. 3) This mustard sheet-pan dinner was also a huge hit in my house (L LOVED it). Pretty easy and quite delicious. Well, now I’m spending the rest of today making chocolate quickbread. So glad to hear you’re having such a fun celebratory weekend!! awww yay for fun family/celebratory times!